Ahh, yes. We've finally come to the one Pokemon virtually anyone can name. 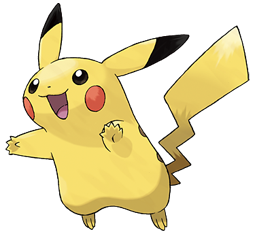 No, folks--just because Pikachu is the most popular Pokemon ever and has been the face of the franchise (hell, you even start out with one that follows you around in the Yellow version), it is not the best Pokemon. It actually loses a lot of points for annoyance, despite the fact it's fairly formidable in battle. When Pokemon Stadium came out it was even able to overcome its one super weakness--Ground types, since you could obtain a Surfing Pikachu. But still, Pikachu was ALL OVER the place, from Pop Tart boxes to having its own voice recognition game for the Nintendo 64 (which I can say wasn't very good, despite not having played it). And its oversaturation on the market drops it down several spots. It's also just very annoying, with its cries of "Pikaaaaa!" Unless it's when you demolish it with a baseball bat on Super Smash Bros., then the cries are not so bad. As a battler, though, Pikachu is quick enough and learns a few useful moves (i.e. Thunder Wave and Thunderbolt, which are really the only two good Electric attacks)...toss in Surf and something like Light Screen or Double Team, and we have ourselves the first Pokemon with a grade higher than a C-. It's not much higher, but hey, baby steps.